Created by the Biology Project at the University of Arizona, this website features an interactive Blood Types Tutorial. 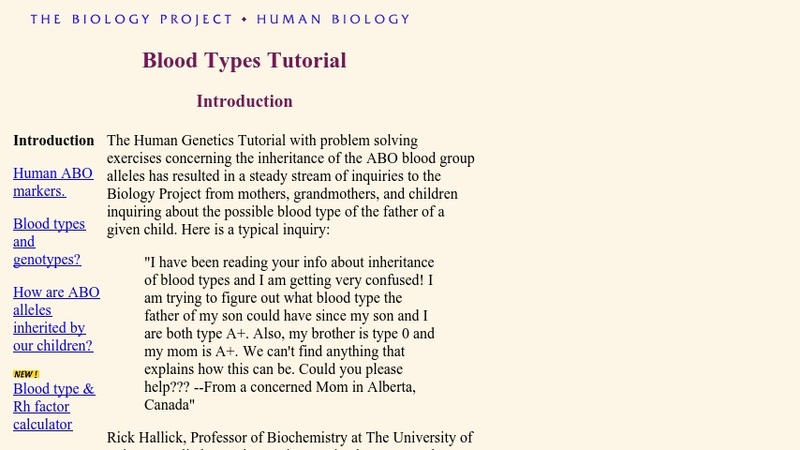 In addition to well-crafted problem sets, this site offers information about blood types, inheritance, and Rh factors. The problem sets for this tutorial were created by using edited versions of questions sent to the Biology Project from curious site users. The questions were answered by Rick Hallick, Professor of Biochemistry at the University of Arizona, and site visitors can compare their answers with Dr. Hallickï¿½s as they work through the problem sets. The Tutorial even provides site users with a Blood Type and Rh Factor Calculator for determining the possible blood type of a child based on the blood types of their parents.